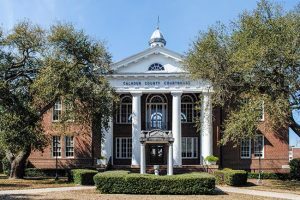 This stately edifice along Russell Street in the Jasper County town of Ridgeland serves as the Jasper County Courthouse. 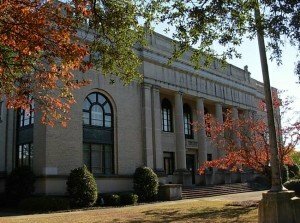 This courthouse was constructed in 1915 and has been the first and only courthouse to serve Jasper County. 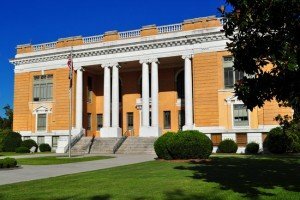 Jasper County was formed in 1912 when portions of Hampton and Beaufort Counties merged together. The county was originally home to the Yamassee and Coosaw Indians and was the site of an early settlement known as Purrysburgh. 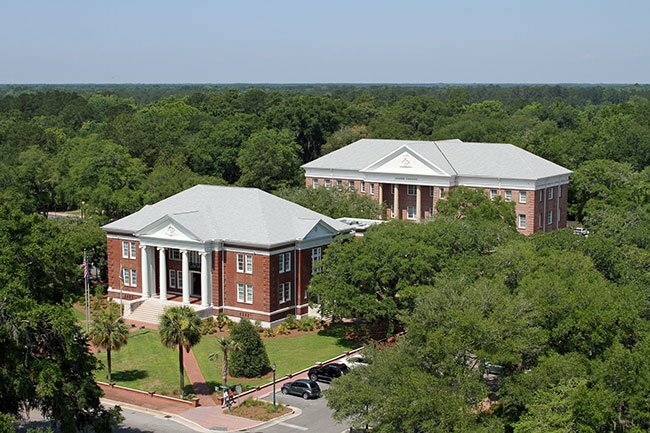 The county was named for Revolutionary War hero, Sergeant William Jasper who served under Francis Marion during the defense of Charleston from the British in 1776. 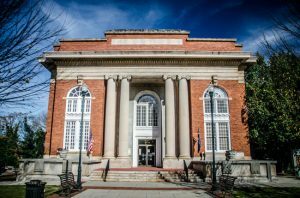 Land for this courthouse was donated to the county by Charles E. Perry, a local farmer, lumberman and merchant, in 1912. 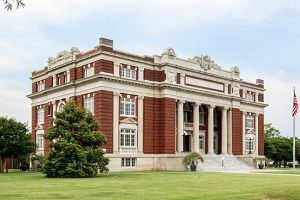 The building’s design was done by notable South Carolina architect William Augusts Edwards who is also responsible for such landmarks as the Abbeville County Courthouse, Sumter County Courthouse, Withers Building at Winthrop University, and Winnie Davis Hall at Limestone College. The design of the courthouse was intentionally substantial to reinforce the importance of the new government. The colossal portico and lot spanning an entire block were done to show power. 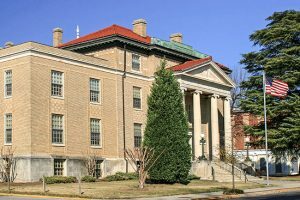 The building’s contractor was noted to be C. V. York and a county bond was noted to have been issued for $30,000 which partially funded the construction efforts. The interior plan is a cross-axis design with a short and broad hall upon entering from the front. This hall is lined with offices and opens onto a larger hall with a double staircase. On the landing of the stairs is a tabernacle frame which is used to reflect what is behind the judge in the courtroom. The majority of the second floor is occupied by a courtroom with judge’s chambers behind. 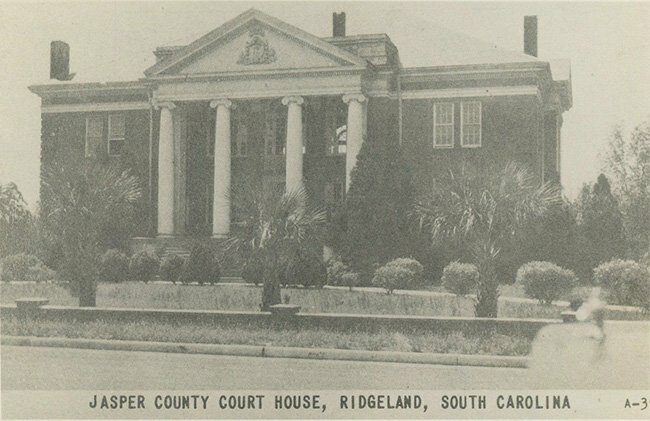 Jasper County Courthouse is the first and only courthouse for Jasper County, which was formed in 1912 from parts of Hampton and Beaufort Counties. The courthouse was built in 1915, according to plans by William Augustus Edwards. C.V. York was the contractor. The courthouse is a two-story brick building of Georgian Revival design. 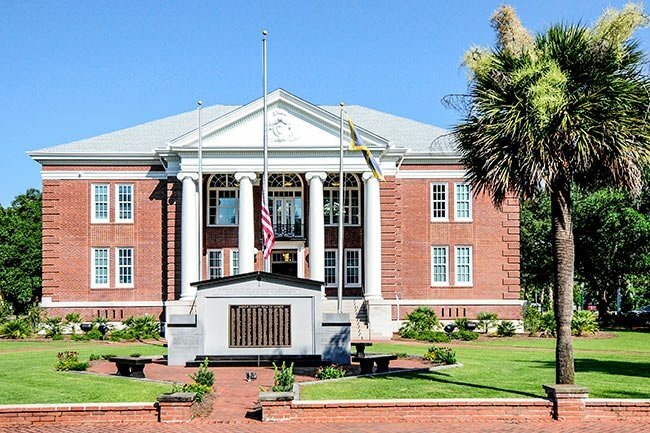 The colossal tetrastyle Ionic portico, the heraldic shield in the tympanum, and the siting of the building, occupying an entire block, are devices intended to establish and reinforce the authority of the newly established county government. The portico, as well, establishes an order by which the entire building is composed. Its entablature is carried around the entire building. The courthouse has a cross-axis plan, with a short, broad hall leading from the portico and a long longitudinal hall perpendicular to the entrance hall. 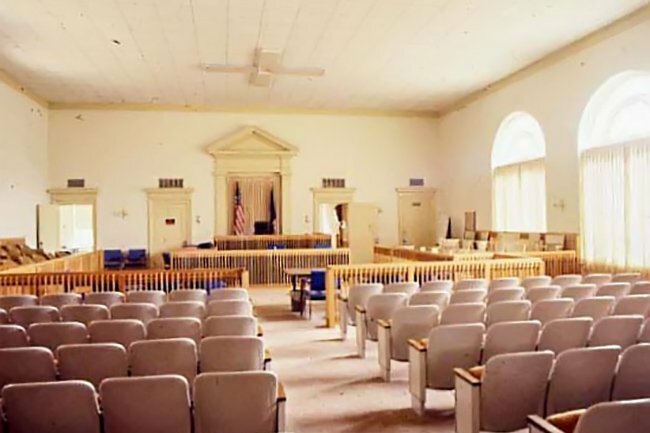 The courtroom occupies most of the second story. A World War I memorial, a flagpole, and a low brick wall complete the grounds.